The Perfect Release will teach any golfer to relax their grip and at the same time, effortlessly maintain a square club face that requires absolutely no manipulation with the hands. This device will teach golfers of any skill level how to set the golf club on plane and allow him/her to "Feel What The Pros Feel". With most training aids, the user needs to work hard to make the aid work properly. With the Perfect Release, the user has to work hard to make it work incorrectly. There is more than one way to release the golf club, depending on the desired shot shape. The Perfect Release lets you freely adjust how you release and feel the feedback immediately. The Perfect Release is great for chipping also and eliminating the "Flip" of the golf club. Perfect Release allows you to feel immediate feedback. Develop a relaxed grip, gain clubhead speed, eliminate your slice, develop a draw, become more consistent, develop a more fluid, dynamic golf swing and LOWER YOUR SCORES when you practice with the Perfect Release. The Perfect Release golf training aid works by using "Dynamic Technology." 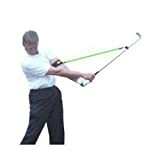 The tension supplied by the specially designed cord actually takes the weight of the golf club out of your hands thus allowing you to relax your grip completely. This also leads to a more neutral grip. A relaxed grip is the most important basic to any pros ability to make golf look so easy and what explains where they get that seemingly effortless power. As well as promoting a relaxed grip, the tension of the cord creates the need for a solid alignment of your hands, arms and club head. If you have a breakdown in this alignment, you will feel it as well as see it immediately. Therefore it teaches you to maintain a solid/aligned position throughout the golf swing. Combining a solid alignment of your hands, arms and golf club with a relaxed grip, allows for and promotes increased clubhead speed, control, and a Perfect Release. The tension of the cord creates the need for a synchronized body turn and arm swing, also known as 'staying connected' for a properly timed, Perfect Release. 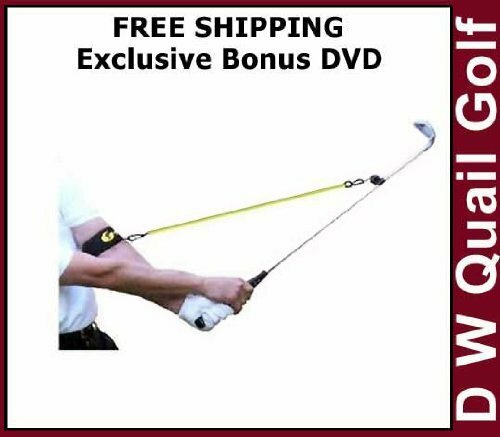 Furthermore, by keeping the cord slightly tense at the top of the backswing insures that a solid and consistent angle between the arm and club shaft has been created Includes an Exclusive Free Bonus DVD From the Golf Lessons With O'Leary Series With Your Order (a $49.95 value) - Limit One Per Order.